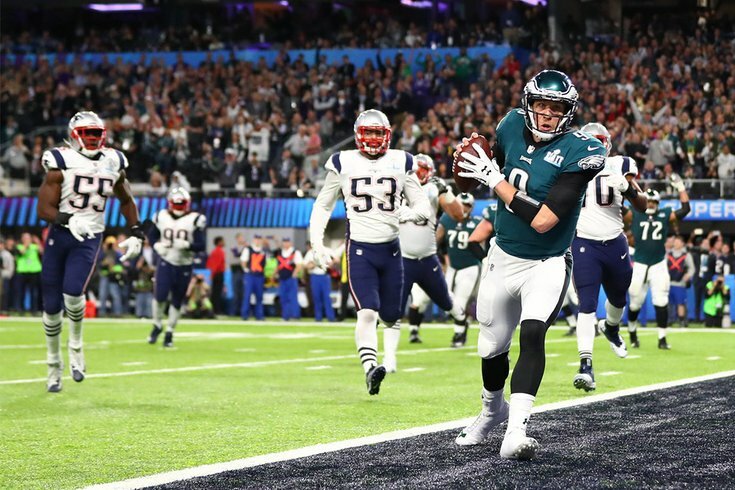 Philadelphia Eagles quarterback Nick Foles (9) catches a touchdown pass against the New England Patriots in the second quarter of Super Bowl LII at U.S. Bank Stadium in Minneapolis. If you're one of those Eagles fans who got the "Philly Special" play design tattooed on your arm or purchased a shirt with the diagram on it, at least one former NFL referee thinks you're celebrating a missed call. Mike Pereira, a former NFL referee and ex-Vice President of Officiating, went on the Talk of Fame podcast Monday and stated that he felt the "Philly Special" should have been flagged for an illegal formation. Pereira currently serves as a rules analyst for FOX Sports, chiming in with interpretations of challenged calls and penalties during NFL broadcasts. There had been some speculation about the play on the night of the Super Bowl, but it was drowned out by a combination of the Eagles' victory, the lack of acknowledgment on the broadcast and the officials' later-revealed right to make a judgment call on the play in question. Essentially, Pereira is arguing that Eagles wide receiver Alshon Jeffery wasn't planted at the line of scrimmage on that gutsy fourth-down call. Therefore, only six Eagles were on the line of scrimmage and the team was technically in an illegal formation. Sound familiar? It's the same violation that cost the Eagles a touchdown during a game against the Seahawks in the 2016-17 season. Nelson Agholor was lined up behind the line of scrimmage on a long touchdown pass to Zach Ertz and the play got called back. Here's the transcript of Pereira's analysis, via ProFootballTalk. “I know the league came out and said that it’s a judgment call, which it is,” Pereira said, via Clark Judge of the Talk of Fame Network. “The down judge, who was the one that [the play] was on his side of the field, they felt that it was his judgment, and [receiver Alshon Jeffrey] was close enough. Well, he wasn’t. They lined up wrong. “Not only that, it’s a trick play. And if you’re going to run a trick-type play, then you have to be lined up properly. You could either have six men on the line, or you could have an ineligible number lined up at the end of the line, which was the case. I know what the league has said, but they would have been a lot more comfortable if they would have called an illegal formation. After the game, a league source told ProFootballTalk that "the league views it as a judgment call, not a call that was clearly right or clearly wrong." What is clear is that video of the play shows Alshon Jeffery communicating with the side judge to confirm that he's lined up legally. Whether or not the official was correct in his judgment, he apparently told Jeffery that he was fine where he was lined up. The fact that the league said it was a judgment call by rule — not a missed call — makes Pereira's obnoxious hair-splitting a moot point here.